Banksy posted a new video to his website implying the partial shredding of his "Girl With Balloon" at a London auction was supposed to have been complete. The video, posted Tuesday, shows the famously anonymous artist constructing the shredding mechanism inside an ornate frame and pushing a button in a black box to activate the destruction at the auction in Sotheby's in London earlier this month. The act shocked the crowd, but the winning bidder, a European collector, went ahead and bought it anyway for $1.4 million, according to the auction house. Sotheby's didn't name the buyer. The partially shredded piece was renamed, "Love is in the Bin." 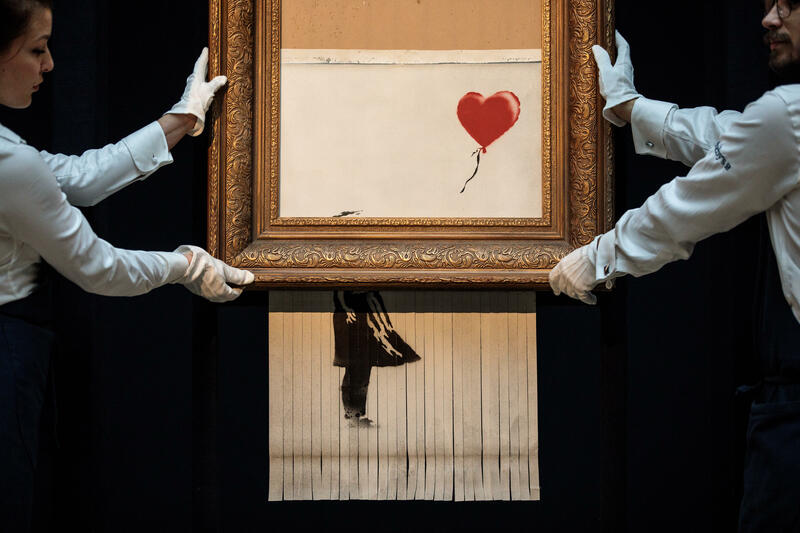 The partial shredding drew speculation that the act was a stunt to increase the value of the painting of a young girl reaching for a heart-shaped red balloon. The canvas was shredded to right above the girl's head, leaving the balloon intact. But the end of the new video notes, "In rehearsals it worked every time..." A complete shredding of the same design is then shown. And on Instagram, Banksy notes, "Some people think it didn't really shred. It did. Some people think the auction house were in on it, they weren't." Sotheby's quoted the buyer of the partially shredded painting as saying, "When the hammer came down last week and the work was shredded, I was at first shocked, but gradually I began to realize that I would end up with my own piece of art history." Alex Branczik, head of contemporary art for Europe at Sotheby's, said it was "the first artwork in history to have been created live during an auction."